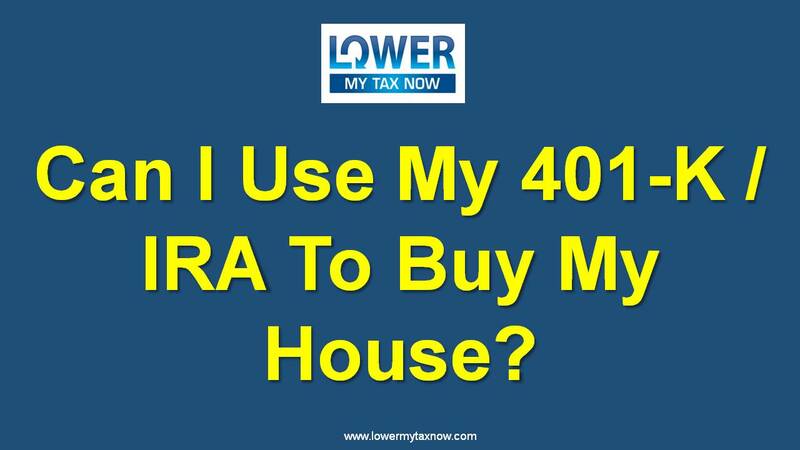 Can I Use My 401-K / IRA To Buy My House? 1. First-time homebuyer – for purposes of IRA distributions, a first-time homebuyer means “you did not own a home the last 2 years”. 2. Roth IRA – if you are considered a first-time homebuyer, you can take out contributions tax free as well as earnings up to $10,000 tax free. 3. Traditional IRA – if you are considered a first-time home buyer, you can take out $10,000 distribution without the 10% tax penalty. However, the $10,000 will still be reported as income. Now, if you take a distribution that is more than $10,000, the excess will be subject to 10% penalty and would be reported as income. 4. Traditional or Roth 401-K – you can take out a loan from your 401-K plan. The amount you can borrow is the lesser of 50% of your account value or $50,000. This is not taxable because it’s considered a loan that you are paying back. To sum it up, if you are planning to buy your home in the future and you are looking for cash, you might want to look into your retirement plans as an option for additional cash down payment while avoiding paying taxes. If you like to learn more, click the link lowermytaxnow.com and sign-in to receive my weekly blog. Until then, this is Noel Dalmacio, your ultimate CPA at lowermytaxnow.com.